To safeguard the quality and reliability of results, a fast and convenient 10min test is available to verify the overall performance of a moisture analyser. 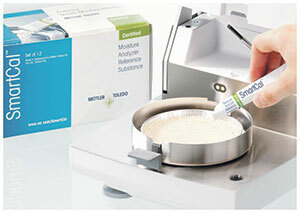 Learn more about this test by downloading from www.mt.com Mettler Toledo’s white paper: A Fast Routine Test Ensures Trusted Moisture Results. Regular verification of measuring devices is essential to ensure valid results and maintain quality. Although routine calibration preventative maintenance of moisture analysers performed by a, qualified service engineer is essential, performance testing between calibration intervals can give an analyst confidence that measurements are consistently correct. This test ing may be neglected because traditional methods may be considered inconvenient and time consuming. SmartCal, however, is a highly temperature sensitive granular material that provides a rapid method for verification of overall performance of a moisture analyser, testing heating and weighing elements simultaneously. This entry was posted in News and tagged Measurment and Instrumentation, Test. Bookmark the permalink. ← All Terrain Wheelchairs: Because the world’s not flat!